Lifestyles of the rich and famous! I loitered all morning at my hosts’ house, overlooking the pool and golf course in the backyard. Madeline was gracious to let me stay so that I could take my radio interview on Nature Bat’s Last from her house instead of having to find a quiet place for my call-in on the streets. 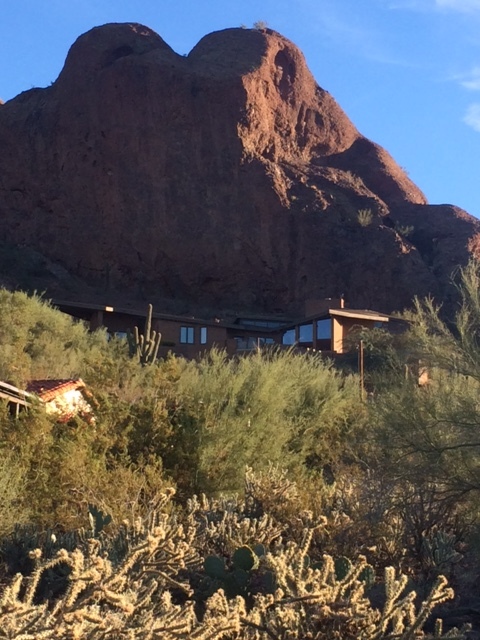 Afterward, I took off to explore Arizona’s tony neighborhoods and was not disappointed. 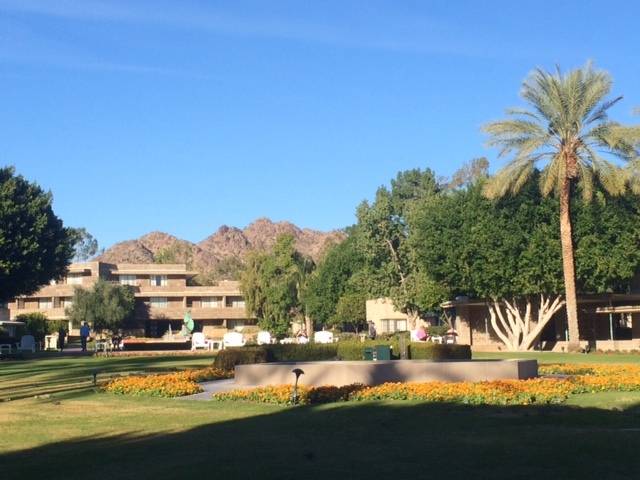 San Francisco, New York, LA, even Seattle may have higher real estate prices, but they can’t match the pizzazz that Scottsdale’s and Pleasant Valley’s immense lots and sprawling homes deliver. True, some houses are ill proportioned; you can’t make a successful 10,000 square foot statement by just pumping up a 2,000 square model and adding a string of garages. 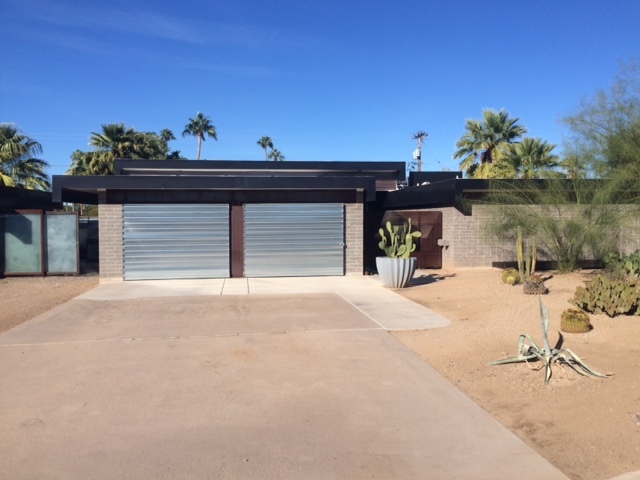 But many of the residences are architecturally striking; with corrugated metal, weathered steel and crisp stucco that fits the desert well. 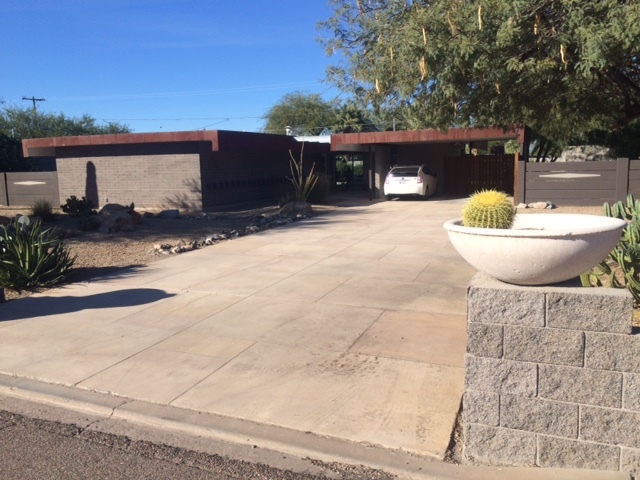 Although the scale of these low-lying mansions is conspicuous beyond reason, I appreciate that most people in Phoenix don’t succumb to the California penchant to grow lawns where they don’t belong. 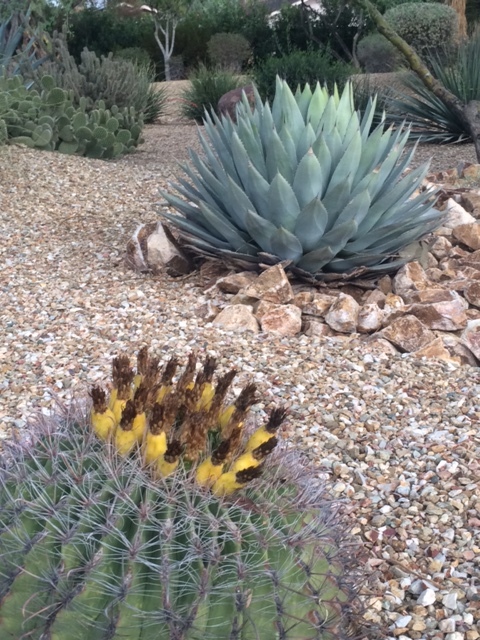 The gravel, sand, and native plant landscaping is terrific. 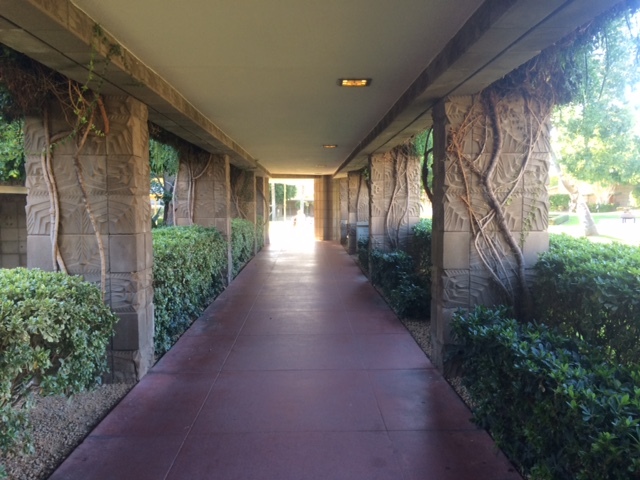 I wound my way to the Arizona Biltmore, Frank Lloyd Wright’s lavish 1920’s resort. Everything about it is classy. The staff was very accommodating to a guy who clearly wasn’t registering for a room; the valet kept a personal eye on my bike. 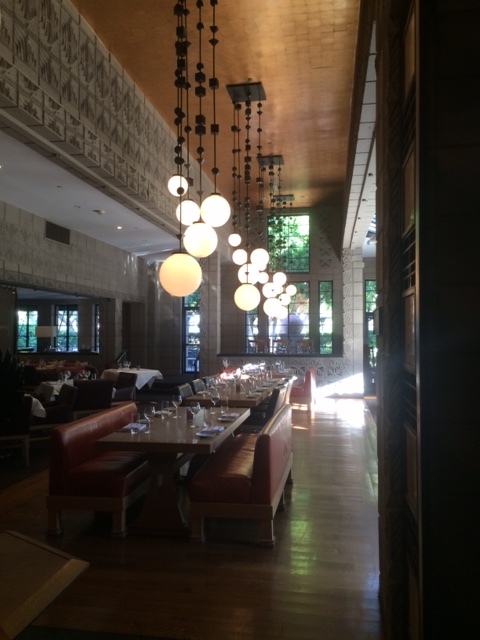 The Biltmore turned out to be one of my favorite Wright buildings, beautifully conceived and exquisitely executed. 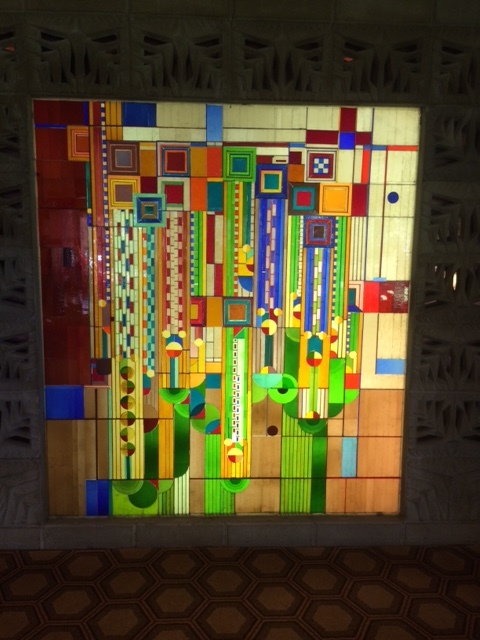 It may be the best example of his two dominant aesthetic ideas, as it was built toward the end of his Prairie / Usonian work and at the beginning of his larger scale, surface ornamented work. The Biltmore plan and massing grow out of the Prairie tradition, albeit with a Southwest sensibility, while the wonderful use of decorative modular block precursors his work at Marin County and the Guggenheim. 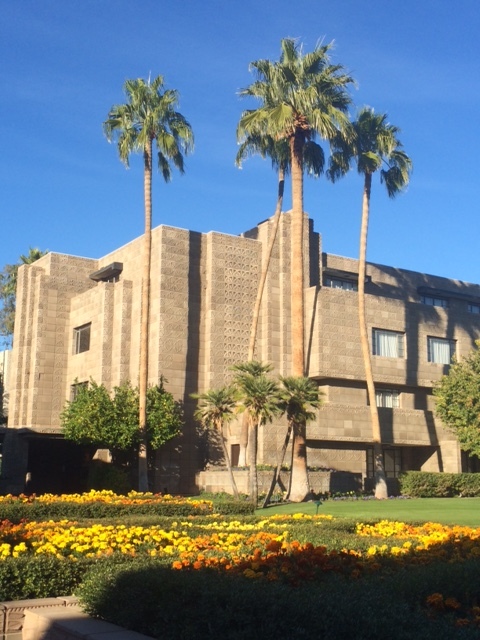 In addition to the great architecture, there are cool photos of Clark Gable, Rita Hayworth, Bob Hope, and other glitterati to cement Biltmore’s cultural status. Every President since Herbert Hoover has stayed there. 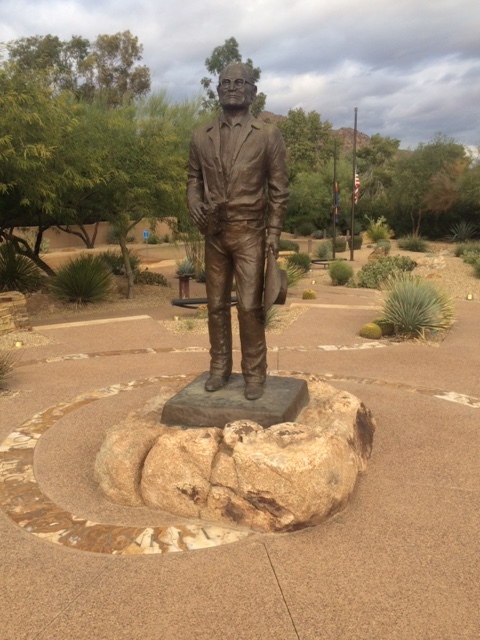 On the way to my second Scottsdale host, I stopped at the Barry Goldwater Memorial. Though he doesn’t merit a Presidential Library, the affluent citizens on this area have erected an elaborate memorial to their favorite son, which includes two marble paths with inlaid bronze letters. Problem is, the quote about the natural beauty of the West is banal, while the one about preserving our nation’s security is fearfully bellicose. Like all of us, Goldwater reflected his origins. In his case, individualism and emphasis on private property led to a logical preoccupation with security. I am glad to be rolling along with everything I need and little that anyone else wants.